While a student at John Paul the Great University in California, Tom Gould would indulge his lifelong passion of drawing by secretly scribbling religious-based cartoons on the classroom whiteboard. He took inspiration from that day’s theology class, Mass readings, and Bible verses. His work got noticed when a fellow student posted some of his work online. “People started to like it,” Gould recalled. A friend realized that it was Gould and coined a name for this mysterious cartoonist – Tomics – a melding of his name and comics. The “T” was designed to look like a cross to promote the religious connection. Although the cartoons were still a fledgling fad, classmate Matt Martinusen, a business major, wanted to create an outlet for Tomics. Martinusen had begun a lay ministry to reach a Catholic audience for men and asked school acquaintances to contribute to his blog and to a self-published book. 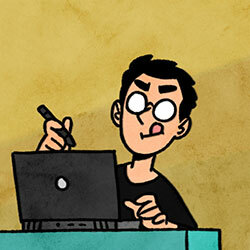 He asked Gould to contribute comics to his website and Facebook page. Gould was thrilled when his funnies were picked up by a Canadian paper, The Catholic Register, which is published by the Archdiocese of Toronto. They are also published on the North Texas Catholic Facebook and Twitter pages. Although he makes his living as a part-time pharmacy technician, Gould continues to draw Tomics and posts them on Facebook @tomicscomics. “If you do what you love, you never work a day in your life,” the artist said. He draws his ideas from the Gospel as well as from meditation. “People like Jesus,” he said simply. “I try to be reverent,” he added. Born in 1993 in Winter Park, Fla., Gould – one of eight children – was homeschooled until fifth grade when he entered public school. His parents were Catholic as were both sets of grandparents. Like most boys, he drew superheroes, trucks, and trains. His favorite cartoonists are Charles M. Schulz, the creator of Peanuts, and Bill Watterson of Calvin and Hobbes fame. “I copied their styles for a while and eventually developed one of my own,” the cartoonist said.